classes are NO JOKE when they call them "INTENSIVE"
incredible. Yet, I wish I could just be a "full time student"
but I sometimes wish I didn't have to do both at the same time. It's just alot right now & hopefully it will get better as I seek God's wisdom in all of this..please pray for me in this season. i need God's grace to not burn out. thanks. looking fwd to the sabbath. and forever. 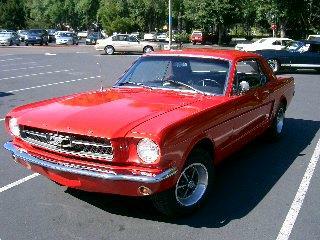 But still God...thanks for my 65' mustang! :)& give me GRACE TO GET THROUGH THE NEXT 6 MONTHS!!!! Hello Family, Friends and Ministry Partners! Praise God I've been accepted into Fuller Seminary! Starting June 23 I will be moving to Los Angeles to attend Fuller's School of World Mission. It is a unique 6-month intensive program focusing on campus ministry beginning June 27, 2005 through Dec 15, 2005. Upon completion I will have finished ¼ of my Masters Degree & received a Certificate of Christian Studies from Fuller. I will then continue forward to finish the rest of my degree (Masters of Arts in Global Leadership) through online correspondence. This is a big transition for me, but it is what's needed. It's a blessing that I will get to spend time with Pastor Che in a close mentoring relationship. At the same time I am so excited to build a deeper Biblical and practical ministry foundation through this unique campus ministry program at Fuller Seminary. In September, as part of the Fuller internship program I will be ministering at UCLA, UCSD and other universities 3 days a week doing hands on campus ministry with our campus church plants out there. It's going to be awesome! My leadership role in Campus Church Networks will remain the same with a few changes in how I spend my time. Our headquarters for Campus Church Networks will stay in San Jose. It will be lead by our staff team there until I return. During the 6-month program I will head back to Hong Kong & Taiwan for a few short ministry trips to equip student leaders. In general, I will cut back on long ministry travels & speak domestically on weekends only, in order to focus on my studies. Once the 6-month training program is finished I will return to the Bay Area & resume back to my normal itinerant ministry travels. All that to say…Praise Him! He is so faithful and so good! Of course going to Fuller is not cheap, so I humbly ask that you would prayerfully consider in supporting my tuition fees. For the full 6 month intensive program the cost is $12,550.00 US. This includes the seminary course costs, books and practical training. If you or your church can partner financially please email me at jaeson@campuschurch.net & mail checks written to me or the ministry (Campus Church Networks 4 North 2nd Street San Jose,Ca 95113 "memo: Jason seminary support"). It would be most appreciated as school has already begun. Thank you for your friendship & love no matter what! Whether you can support or not, please continue your prayers. May God use this focused season to equip me to equip this generation to fulfill the call to reach the youth of all nations for Christ! "Must you go to China? How much nicer it would be to stay here and serve the Lord at home!" She made it plain at last that she would not go to China." "You can do something other than working with God in His purpose, but it will always be something lesser, and you couldn't come up with something better." "The command has been to "go," but we have stayed - in body, gifts, prayer and influence. He has asked us to be witnesses unto the uttermost parts of the earth... but 99% of Christians have kept puttering around in the homeland." "While vast continents are shrouded in darkness... the burden of proof lies upon you to show that the circumstances in which God has placed you were meant by God to keep you out of the foreign mission field." "I wasn't God's first choice for what I've done for China... I don't know who it was... It must have been a man... a well-educated man. I don't know what happened. Perhaps he died. Perhaps he wasn't willing... and God looked down... and saw Gladys Aylward... And God said - "Well, she's willing." "Brother, if you would enter that Province, you must go forward on your knees." "The man... looking at him with a smile that only half concealed his contempt, inquired, "Now Mr. Morrison do you really expect that you will make an impression on the idolatry of the Chinese Empire?" "No sir," said Morrison, "but I expect that God will." "And people who do not know the Lord ask why in the world we waste our lives as missionaries. They forget that they too are expending their lives... and when the bubble has burst they will have nothing of eternal significance to show for the years they have wasted." "Jehovah Witnesses don't believe in hell and neither do most Christians"
"Had I cared for the comments of people, I should never have been a missionary." "Young man, sit down: when God pleases to convert the heathen, He will do it without your aid or mine." "We must be global Christians with a global vision because our God is a global God." "God's work done in God's way will never lack God's supplies." "If Jesus Christ be God and died for me, then no sacrifice can be too great for me to make for Him." "The greatest missionary is the Bible in the mother tongue. It needs no furlough and is never considered a foreigner." "Prepare for the worst, expect the best, and take what comes." "The saddest thing one meets is a nominal Christian. I had not seen it in Japan where missions is younger. The church here is a "field full of wheat and tares." "I used to think that prayer should have the first place and teaching the second. I now feel it would be truer to give prayer the first, second and third places and teaching the fourth." "It is just as proper, maybe even more so, to say Christ's global cause has a Church as to say Christ's Church has a global cause." "If you are sick, fast and pray; if the language is hard to learn, fast and pray; if the people will not hear you, fast and pray, if you have nothing to eat, fast and pray." "What are we here for, to have a good time with Christians or to save sinners?" "I tell you, brethren, if mercies and if judgments do not convert you, God has no other arrows in His quiver." "It's amazing what can be accomplished if you don't worry about who gets the credit." "Two distinguishing marks of the early church were: 1) Poverty 2) Power." "Do not think me mad. It is not to make money that I believe a Christian should live. The noblest thing a man can do is, just humbly to receive, and then go amongst others and give." "From my many years' experience I can unhesitatingly say that the cross bears those who bear the cross." "I pray that no missionary will ever be as lonely as I have been." "All my friends are but one, but He is all sufficient." "How little chance the Holy Ghost has nowadays. The churches and missionary societies have so bound him in red tape that they practically ask Him to sit in a corner while they do the work themselves." "Expect great things from God. Attempt great things for God." "God's part is to put forth power; our part is to put forth faith." "I feel now, that Arabia could easily be evangelized within the next thirty years if it were not for the wicked selfishness of Christians." "The Indian is making an amazing discovery, namely that Christianity and Jesus are not the same - that they may have Jesus without the system that has been built up around Him in the West." "This gospel of the kingdom shall be preached in the whole world as a testimony to all the nations, and then the end will come." "All roads lead to the judgment seat of Christ." "Obedience to the call of Christ nearly always costs everything to two people- the one who is called, and the one who loves that one." "Christians don't tell lies they just go to church and sing them"
"I have said that there is nothing in the world or the Church, except it's disobedience, to render the evangelization of the world in this generation an impossibility." "I will lay my bones by the Ganges that India might know there is one who cares." "Today Christians spend more money on dog food then missions"
"It will not do to say that you have no special call to go to China. With these facts before you and with the command of the Lord Jesus to go and preach the gospel to every creature, you need rather to ascertain whether you have a special call to stay at home." "We talk of the second coming, half the world has never heard of the first." "God cannot lead you on the basis of facts that you do not know." "And thus I aspire to preach the gospel, not where Christ was already named so that I would not build on another man's foundation." "Why do we insist on building the largest and most impressive structures in our city when people on the other side of town are hungry, jobless and worshipping in storefronts?" "If every Christian is already considered a missionary, then all can stay put where they are, and nobody needs to get up and go anywhere to preach the gospel. But if our only concern is to witness where we are, how will people in unevangelized areas ever hear the gospel? The present uneven distribution of Christians and opportunities to hear the gospel of Christ will continue on unchanged." "I spent twenty years of my life trying to recruit people out of local churches and into missions structures so that they could be involved in fulfilling God's global mission. Now I have another idea. Let's take God's global mission and put it right in the middle of the local church!" "God provides the men and women needed for each generation." "Oh dear, I couldn't say that my church is alive and I wouldn't want to call it dead. I guess it's just walking in its sleep!" "When he landed in 1848 there were no Christians here; when he left in 1872 there were no heathen." "I am ready to burn out for God. I am ready to endure any hardship, if by any means I might save some. The longing of my heart is to make known my glorious Redeemer to those who have never heard." "At the moment I put the bread and wine into those dark hands, once stained with the blood of cannibalism, now stretched out to receive and partake the emblems and seals of the Redeemer's love, I had a foretaste of the joy of glory that well nigh broke my heart to pieces. I shall never taste a deeper bliss, till I gaze on the glorified face of Jesus himself." "Save others, snatching them out of the fire." "The evangelization of the world in this generation." "Other sheep I have which are not of this fold; them also I must bring." "Missions is not the ultimate goal of the church. Worship is. Missions exists because worship doesn't." "His authority on earth allows us to dare to go to all the nations. His authority in heaven gives us our only hope of success. And His presence with us leaves us no other choice." "Today five out of six non-Christians in our world have no hope unless missionaries come to them and plant the church among them." "Tell the students to give up their small ambitions and come eastward to preach the gospel of Christ." "Christ for the students of the world, and the students of the world for Christ." "We who have Christ's eternal life need to throw away our own lives." "Some wish to live within the sound of a chapel bell, I want to run a rescue shop within a yard of Hell." "God has huge plans for the world today! He is not content to merely establish a handful of struggling churches among each tongue, tribe and nation. Even now He is preparing and empowering His Church to carry the seeds of revival to the uttermost ends of the earth." "The mark of a great church is not its seating capacity, but its sending capacity." "Answering a student's question, 'Will the heathen who have not heard the Gospel be saved?' thus, 'It is more a question with me whether we, who have the Gospel and fail to give it to those who have not, can be saved.'" "Young man, are you seeking great things for yourself? Seek them not! Seek first the Kingdom of God!" He couldn't sleep all night. He finally got up and had the courage to meet with Studd. He later said that the meeting with Studd was the "decisive hour of his life". He went on to become the greatest missions mobilizer in world history. "There is something wonderfully misleading, full of hallucination and delusion in this business of missionary calls. With many of us it is not a missionary call at all that we are looking for; it is a shove. There are a great many of us who would never hear a call if it came." "I have found that there are three stages in every great work of God; first, it is impossible, then it is difficult, then it is done." "I love to live on the brink of eternity." "The greatest tragedy to befall a person is to have sight but lack vision." "'Not called!' did you say? 'Not heard the call,' I think you should say. Put your ear down to the Bible, and hear him bid you go and pull sinners out of the fire of sin. Put your ear down to the burdened, agonized heart of humanity, and listen to its pitiful wail for help. Go stand by the gates of hell, and hear the damned entreat you to go to their father's house and bid their brothers and sisters, and servants and masters not to come there. And then look Christ in the face, whose mercy you have professed to obey, and tell him whether you will join heart and soul and body and circumstances in the march to publish his mercy to the world." "Here is a test to find whether your mission on earth is finished: If you are alive, it isn't." "If God has fit you to be a missionary, I would not have you shrivel down to be a king." "Why doesn't your God speak my language?" "I am willing to go anywhere, at anytime, to do anything for Jesus." "The 3.5 billion unreached people on earth would form a single file line that would stretch around the equator 25 times! Can you picture 25 lines of Christless people, trampling endlessly toward hell? Let that vision stay with you day and night." "God does not have to come and tell me what I must do for Him, He brings me into a relationship with Himself where I hear His call and understand what He wants me to do, and I do it out of sheer love to Him... When people say they have had a call to foreign service, or to any particular sphere of work, they mean that their relationship to God has enabled them to realize what they can do for God." "A little prayer, little power; no prayer, no power." "When God's finger points, God's hand will open the door." "I will open Africa to the gospel or die trying." "None but women can reach Muslim Women... So we have a solemn duty in this matter that we cannot shift. The blood of souls is on our skirts, and God will demand them at our hands." "The church that does not evangelize will fossilize." "As long as there are millions destitute of the word of God and the knowledge of Jesus Christ, it will be impossible for me to devote my time and energy to those who have both." "If sinners be damned, at least let them leap to hell over our bodies. And if they perish, let them perish with our arms about their knees, imploring them to stay. If hell must be filled, at least let it be filled in the teeth of our exertions, and let not one go there unwarned and unprayed for." "We have a God who delights in impossibilities." "Why do you need a voice when you have a verse." "The history of missions is the history of answered prayer. From Pentecost to the Haystack meeting in New England and from the days when Robert Morrison landed in China to the martyrdom of John and Betty Stam, prayer has been the source of power and the secret of spiritual triumph." Its about 2am right now in Paris. I'm sitting at a local cafe simply enjoying the night. There are people everywhere on the lighted streets & its like the night has just begun. This city is amazing...full of life on every corner. The French people are not only incredibly classy & attractive, but its just a blessing to see how they fulIy enjoy life. There are cafes on every street corner and people sit in front of the cafes looking out into the street just conversating & talking into the night. Everything is unique & eye catching...I love looking at the architecture of all the european buildings. Paris is a very special place. During the nights I've just been spending time walking the streets, getting lost, and talking with God for hours. I've also been doing a bit of reflecting and soul searching. Yeah, a lot to think about and reflect on. I came here to plan with a few leaders the future of the Global Day of Prayer....they couldn't have chosen a better place to hold the meeting :P Well, I guess this is God's little treat for me before I move to LA and start Fuller Seminary in a week. Thank You Father for this blessing! Thank You for the blessing to experience a beautiful city like Paris. I can also see why Paris is known as a city of romance :) ha...I'm sure one day I'll find that special someone and we'll be able to experience Paris together. Just a thought....until then, Jesus keep my eyes on You & may my heart truly find its complete satisfaction in You alone. Really, Jesus....this is incredible fun spending the night with You here in Paris typing away on my cell phone :) I am blessed! I love Paris! Father bless this city and country with Your presence & fill it completely with Your love! Praise God: We Got the House! Praise God! We got the house! I emailed many of you a few weeks ago explaining how we were in danger of losing our home two days before closing on escrow. All I can say is a "miracle" happened, God is faithful & we didn't lose the house! I never would have imagined that as a missionary at my age I would be able to buy a home for my family. But by God's grace last Thursday my mother and I signed documents to own our first home in Sacramento California. It's been my dream to buy my parents a house & I never thought it would happen so soon. This entire process has been a true test of my faith. I would like to share the testimony of how God provided this home for my family. From beginning to end it was His vision and His provision. My mother raised my sisters and I singled handed. My father was in and out and we never had a steady household income. Owning a home was never in my mothers mind, but something like a far-fetched dream. About a year ago, God put this desire in me to believe that He would one day provide my parents a place to retire and rest. I used to think, "no way" could I ever buy a home because I'm a missionary on a "missionary salary" and it would take me many years to save up for a down payment. Well, where there is no way, God makes a way! In January of this year I was having dinner at a couples home in San Jose. After dinner we decided to have a time of prayer for one another. While they were praying for me the wife began to prophesy, "Jaeson, I see that the Lord is going to give your family their own home, I see the Lord giving you a little white house!" I thought to myself, "well I'm sure the Lord will provide this house sometime far in the future." I never thought it would be this soon. A few weeks later I was on a United Airlines flight on my way to preach in Hong Kong. I ended up sitting in the "premiere" section just behind business class. For some reason, a high-powered CEO had to sit next to me because there was no more room in the business class. We ended up talking and sharing about our occupations. He was a really successful investor so I asked him, "What would you advise a young man like myself in his early twenties on how to invest wisely?" He immediately responded with two words: buy property! I told him that was a nice idea, but I didn't have the money to do so. He told me that I didn't need to have a lot of money to buy property. In fact, there were ways to get loans with "no money down" if I had good credit. Well, I was pretty sure I had good credit, but I was a bit skeptical, yet at the same time inspired. After my ministry trip to Hong Kong I went back to California with the two words "buy property" still in my head. I ended up asking a few friends in real estate if it was possible for me to qualify for a home loan. One friend had just bought his first house through a government program called "CALHFA." It is a program that specifically helps first time homebuyers to get into their first house with "no money down." Yet, in order to qualify for this program you would have to meet certain requirements. These were requirements I knew I didn't have because of my occupation as a missionary who raises monthly support. I decided to call the loan agent to give it a try anyways. I totally thought there was no chance I would be approved. But the loan agent told me after reviewing my credit scores and submitting my file to the underwriter they "pre-approved" me for a government loan. I was in shock & immediately began to house hunt! The loan amount was a $330,000 maximum loan because we didn't have a deposit and high monthly income. With that amount I looked for some time in the San Jose Bay Area and could find no homes in that price range. There were only small condos that were not large enough for my family to live in. The median home price in the Silicon Valley was $650,000 dollars. The only place in Northern California where there were still decent homes under $400,000 dollars was in the Sacramento area. I asked my loan agent if there was any way we could increase our loan? He said, "only with a down payment of at least $30,000 dollars." This next miracle is totally God! During the whole loan process my family was going through major spiritual attack. My sister went under massive spiritual warfare against her mind & my family was going through major conflict. A friend of mine was in prayer knowing about my family situation and decided to give my family a love offering of $30,000 dollars! I had never received such a generous offering in my life and this friend told me to use it for whatever purposes to help the family. When I received this check I just sat in awe and complete humility before almighty God. I was so broken and so blessed. It was a blessing beyond my imagination & I will be forever grateful for God's provision. How God never ceases to amaze me! While were in the process of re-filing to increase our loan amount, I drove my sister to Sacramento to get counseling help. We ended up driving into a nice developing area in Sacramento where the Pastors wife lived. I found out from the counselors that the area was flourishing & the homes were affordable to our standard. That night I went back home to look online at homes in that specific area. The website I randomly submitted my search with ended up calling me the next day to offer assistance. The realtor who called me asked me what was my occupation? I told him I was a young pastor and he responded exuberantly saying he was a Christian too with hopes one day to retire and become a full-time missionary! In fact, one of his main passions has been to specifically help pastors buy their own home so they could focus on the ministry. He told me, "Don't worry Pastor Ma I've helped 5 pastors buy homes in this area and I will get you the best deal!" Well, moving to Sacramento is a big move since my family has lived in San Jose for nearly all my life. I needed to get the wisdom and council of my Senior Pastor. So I called him asking for advice and he basically told me, "Jaeson, you definitely need to stop renting and buy a home. If you can, find a Christian realtor to help you move just outside of the Bay Area to a nice quite and developing city." My Senior Pastor had no clue I just met a Christian realtor that morning with a desire to help me buy a home in a nice, quite and developing city in Sacramento. I now had the peace to go search for a home north of the Bay Area. I only had two days to look for a home in Sacramento before I left for another ministry trip back to Asia. We were lucky to have just in time our increased loan pre-approved with a signed approval letter from the loan agent so we could put an offering on a home if we found one. Our new Christian realtor found about 10 homes for us to see. Yet, there was one particular house that he said was the best value and best price. It was a "little white house" surrounded by a beautiful lake and custom designed million dollar homes. I thought it would of course be unaffordable, but he said this was a "track house" and it was going for $370,000 dollars. The neighborhood was rated one of the best in Sacramento county… in fact not only did it have the best schools, outdoor environment, & safe neighborhood, but it had what my mom needed most "a big Chinese supermarket" close by! We decided to put an offering on the home. Later we found out there were already 14 other offers on the house. My Christian realtor told us he knew the seller and would do all that he could to convince him to sell us the house, especially because I was a full time pastor. He said there would be a high possibility the seller would raise the price on the home with so many bidders. Later as I prayed with my mother about the situation I told her that it was in God's hands. I specifically told her that the maximum loan amount we could afford if the seller raised the price was $380,000. If the bid came back higher we would not buy and wait on God's direction. The next day our Christian realtor came back to us and told us that the seller reviewed the bids and we made it into the final 7 bids. Yet, the bad news was the seller raised the price to $382,000 dollars! In my heart I knew I couldn't go forward even though it was only $2000 more because I promised my mother who was concerned about whether we could afford the monthly payments. Without sharing to my Christian realtor my promise to my mom out of the blue he said, "Pastor Ma, I know that $382,000 is a lot more, so just to help you out I will personally give you some of my earnings and write your family a personal check if you get the house for $2000 to go towards your new home!" That $2000 blessing brought the price down to $380,000 exactly. We decided to go forward with the bid & by a miracle…we got the bid! Everything seemed fine as we were given 30 days to close on escrow. During this period my loan agent assured me the process would run smooth and that I could be assured the loan process would close on time. During that time, I had already put a $5000 deposit that could not be refunded if the house didn't close. Before I did that I checked with my loan agent to be sure that everything was solidified. He gave full assurance that I had nothing to worry about. During the 30-day process my loan agent began to concern me. He began to tell me that the underwriter who approved our loan needed more documents and verifications of employment. It was troubling as day in and day out I had to get him signed letters from my personal donors & detailed documents of my employment history. I began to question whether or not we were really approved. He again assured me that if I got him the proper documents it would be fine, I did so, but he was not honest. On the second to last day before we were to close on escrow we still were unsure on the loan closing. He finally gave me a call and told me there was bad news. Their original underwriter had made a mistake in qualifying me for the government loan & the senior underwriter reviewed our loan and rejected it. Two days before closing on the home our loan was rejected & it seemed all was lost. My sister a former loan processor was very upset because our loan agent gave us a written approval letter stating that the underwriter had completely approved our loan, yet in reality they never did. I was a very disappointed and upset at first realizing I was not only in jeopardy of losing my $5000 deposit, but also the house! Yet, the Holy Spirit reminded me of 1 Thessalonians 5:18 "Give thanks in all circumstances for this is God's will for you in Christ Jesus!" At that moment, the situation was out of my hands and I just went into my living room and began to pray in the spirit and praise God out loud over the situation. I prayed till I completely released the matter to the Lord and felt His peace. Somehow, I knew it would work out for the good. "If I do God's business, He will do my business!" We were given a one-week extension to close on escrow from the seller. Since we couldn't trust the first loan agent to come through for us we had to pray for another option. My aunt was a loan agent and told me there was a possibility we could get a loan within a few days. Yet, in order to qualify for the loan I would have to put 10% down on the house, which meant an extra $10,000 dollars, I didn't have. When she told me this I was on my way to New York to speak at a youth conference. When I got to New York I didn't want to worry about the whole house situation so I prayed to God, "If I do your business, God You will do my business!" At the retreat the power of God moved in a great way among the students. Over 100 students committed their lives to spending one year of their life reaching university students in East Asia. Many parents were weeping as they watched their children surrender their lives to Jesus right in front of their eyes…it was a glorious sight! After speaking in the main Sunday morning session a man randomly walked up to me. I didn't know him and he handed me a personal donation check. I thanked him for it and put it in my back pocket, not expecting much. A few hours later I pulled the check out of my back pocket and I stopped dead in my tracks, completely stunned. It was a check written out to me personally for $10,000 dollars! "God if I do Your business You will do mine!" Yes, He did! I was now able to tell my aunt I could put 10% down on the house and she was able to secure me an incredible interest rate 3 days before closing on escrow. We now had two business days to submit the loan and get it approved. By God's grace in less than 48 hours both loans were approved! It was a miracle for sure compared to my first loan agent who took more than 30 days and he still couldn't pull through on approving our loan! By God's grace & provision all I can say is…GOD IS GOOD! GOOD! GOOD!We closed the house exactly on the last day of our extension. I can't even begin to express the joy in my heart when I saw my mom sign the documents to put her name on the title of the new house! My mom is a proud owner of her very own home & it is all because our God is a GOOD Father who provides for His children! Thank you all for your prayers, love, support and encouragement! Thank you for standing in faith with my family for this house! From beginning to end this house was a testimony to God's faithfulness. This entire journey has brought me to a new level of faith & humbled me…beyond words…I am so humbled that Father God would bless my family in such an extravagant way. We don't deserve this, but He chooses to bless because He loves us. So many in this world have no home, barley anything to live on, yet we are able to own a home in a place like California. Father…Thank You! (God be with you) before I left. just in awe standing there listening to her share her heart and gratitude toward God in the midst of all her trials and pain. Is God good or what? Praise Him! That conversation did something in my heart, I guess just a deeper respect for what many women have to go through & the strength they have to carry that I guess many don't know or understand sometimes. I've been able to connect with my acting agent alot more. He's gone through some major STUFF this past month. We've been talking about spiritual issues for more than a year now and God has been moving in His life in powerful ways. We watched Constantine together and discussed the spiritual concepts and realities in the movie together. I ended up sending him the "Purpose Driven Life" and a book on "Spiritual Gifts" because I believe he has the gift of discernment and the word of knowledge without knowing it yet. Well, he shared how he has been reading the Gospels and just as he started getting into it, he got into a near fatal car accident. The witnesses said he should have been dead, yet he made it out alive. He told me how he had just put on a Christmas ornament angel into his car to hang & was praying for God's protection. When he got out the hospital he went to the junk yard to see his car. It was completely totaled and both sides were caved in at 90 degree angels. He went through the wreck to dig out the angel ornament. In the email he wrote me, "I knew it wasn't my time yet, God was watching over me with His angels" he's now awakened to a new spiritual level and realizing God's purpose for his life. keep praying for my acting agent. God's moving in his life big time. I love how God is faithful, how we works in every life, in every way. it never ceases to amaze me. He can always turn what the enemy intended for evil for good. amen. tonight i had dinner with a long time friend from junior high. ha..i use to have a crush on this gal from like the 8th grade through my junior year in high school :P since then we've always had a great friendship through the years. We ate at this new singapore joint in san jose and got caught up. Man, its been 2 years since we've talked! It was sooo awesome to hear how God has worked in her life. She is a Catholic Christian and is much more discreet about her faith and yet it is still deeply rooted in her. She knows Jesus in her own way and I so very much respect her genuine faith in God. She also has gone through lifes trials. And just both of us sitting there sharing about how "dysfunctional" both of our families are & yet how faithful God is, I love it! It's been years, but it felt like we had not seen each other only for a few months. I love those kind of friendships. The ones where there is deep connect, a history behind the friendship that can only come through shared experience and life together. The ones where you can look back and laugh, cry and appreciate. She was so in awe of how God has been taking me around the world to different nations, yet, I was probably more in awe of her passion to help those in need, her simple dream to become a nurse and just hearing how she sacrificed her independence to move back home with her single mom to take care of her and her little sisters. That's love. It was awesome to see how happy she was to own her first brand new car (Toyota mini tcion), make her own payments and feel good about saving on gas mileage. It was great to just see her happy and thankful to God for saving her life from a near car wreck she told me about and taking each day for the best it offers. I was able to share my share of stories and trials...& that is what friendship is about. Loving, listening and being there for one another on life journeys. I also went to Youth for Christ's Super Sunday at Great America. wow, it was like a San Jose youth pastor and youth group re-union. I saw Ted and Sandy from SJCAC, David Huynh and his new girlfriend and the TAPC youth, Pastor Bryan Zaler, Ed Black, Kevon Saber, Jose Erazo, Pastor Ben Guerro, Justin Eldred, Big Chief Maurice Miller, Pastor John Delke and so many others. Not to mention about 2500 youth and a few hundred giving their life to Jesus! I love it! It was like eventhough I haven't been doing much youth ministry in San Jose this past year, God reminded me that He's still into the business of REVIVAL and is continuing His work of unity and power with the youth pastors I've duked it out with in the trenches the past 6 years. Yes, I BELIEVE ...REVIVAL IS COMING TO THE YOUTH OF SAN JOSE. That day I was so encouraged and thanking God for the good men and women of God who are STILL FAITHFUL to serve the young people eventhough they have not seen the PROMISE, they are still SERVING. Faithfulness is a beautiful thing. Consistency is an intangible virtue that brings forth the glory of God's love. I saw that in the hearts and the eyes of faith in each one of those pastors. As tired as they were, I could still see their passion. Seeing that was worth more than hearing a thousand perfect sermons. Passion never gives up. Thank you for your prayers for our teams in Africa and Asia. I just wanted to attach a few praise reports from Hong Kong, Africa and elsewhere for you to read. The Global Day of Prayer was truly an amazing work of the Lord and a new beginning for the Church worldwide. Reports estimate over 200 million worldwide prayed on May 15 in over 160+ nations!!! Check out this video below a 1/2 hour special on what happened worldwide on May 15, 2005 GDOP. You must watch this...it's AWESOME! Attached are some pictures from the HK events! Thank you also for your prayers for me in South Africa. It was a privilege to pray and not only represent the youth of the world, but I was the only ASIAN representative in the worldwide broadcast! It was another confirmation that Africa & Asia will arise and work together in fulfilling God's end time purposes! The fire of God fell upon the youth in South Africa and Asia in all our meetings. On May 14th in both Cape Town and Hong Kong the youth prayed through the night relentlessly. I really sensed the Lord confirmed to me again through numerous divine answers to prayer that He will raise up a great end time student missionary force out of Africa and Asia back to Jerusalem! More on this later...keep praying and thanks for the prayers!!! I will be heading to France June 15-20th to plan with the Global Day of Prayer leaders on strategic next steps for GDOP in the next 4 years. Specifically, pray God reveals his heart for the involvement of "youth" in GDOP worldwide. A 2nd reformation is coming and may God mobilize youth all over the earth into this coming great end time harvest! 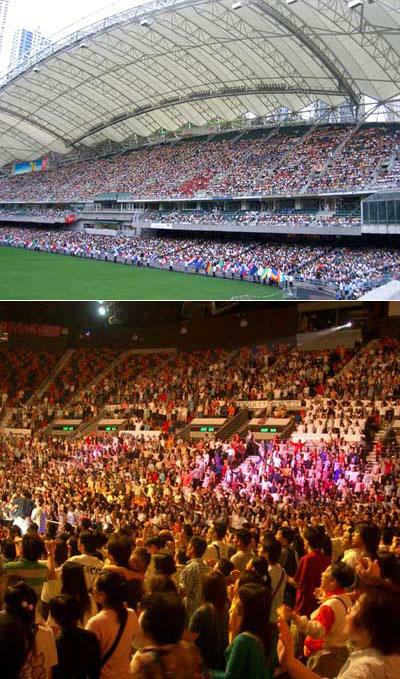 The Global Day of Prayer in HK was a truly amazing event as the Hong Kong Stadium and Hong Kong Coliseum were both filled with Christians from all walks of life praying and praising God in unity. The day started beautifully with splendid weather. It had been raining the whole week before the event with thunderstorms, strong winds and lightning but on the day, the skies were beautifully blue and the sun shone brightly. 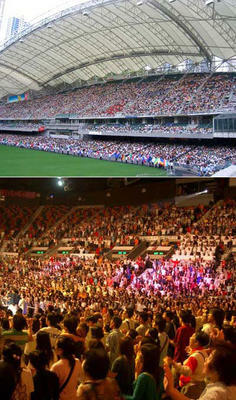 The crowd in the outdoor Hong Kong Stadium marveled at the wonderful weather. The event started with a lively dance and a spectacular flag parade. As the flag bearers entered the stadium each bearing a flag of a different nation of the world, the crowd erupted into applause and were also moved to tears as Hong Kong was reminded that they were joining the 200 million believers from around the world in prayer. With the blowing of the shofars and the proclamation of Psalm 24, the event continued with the worship team and 1000-member choir leading the crowds in joyful worship. government officials and pastors prayed for the different nations. unity in families of people around the world. At this time, the crowds also prayed for China, the motherland of Hong Kong. The crowd in the stadium was asked to all stand and face north, the direction of China,and to lift their hands to pray blessing upon China. The crowd was then led into prayer for Hong Kong. Representatives of the government, business sector, schools, youths, and new immigrants all came together and led the crowds to pray for God's blessing upon each area of society. for; giving thanks to the Lord for them and asking His blessing upon them. There was also a call of unity as pastoral staff were asked to come together to declare that they belong, not to a certain church or denomination, but that they belong to and serve the Church of Hong Kong. It was deeply moving to see over three hundred pastoral staff gather by the stage, holding hands and singing the 'Song of Unity' so as show their commitment to unity in serving Hong Kong. having seen the glory of God and knowing that they were a part of the largest prayer meeting in world history.